Once upon a time, around 5,600 years ago, someone pegged a set of wheels to a cart; 4,400 years later the tracks of Baghdad were finally paved with tar. But it wasn’t until 1817 that German Baron Karl Drais von Sauerbronn put two wheels beneath a simple seat. Two hundred years later, the bicycle represents the most efficient ways to transform the human power into movement. So reads the opening passage of Velo 2nd gear – a new book dedicated to bicycle culture and style. The book has been put together with a degree of care and attention that will appeal to any cyclist – whatever their own particular area of interest. With 169 pages bursting with the wonderful diversity of cycling, unusual custom designs, bike fashion and accessories abound. 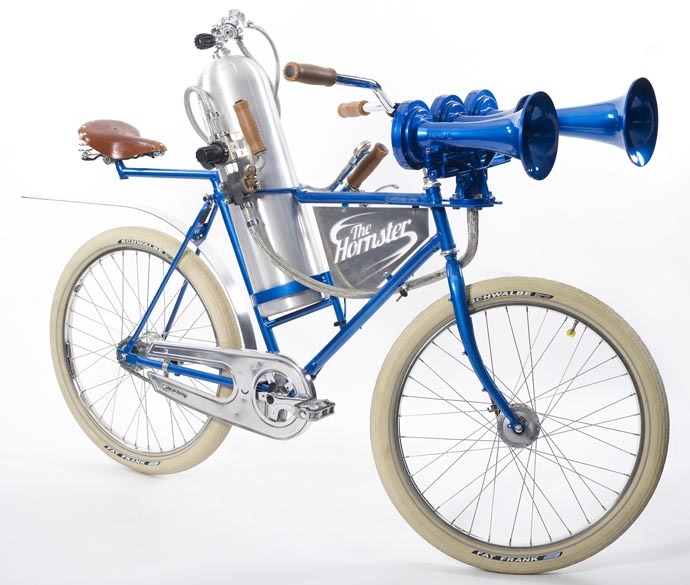 Pages 160 and 161 of Velo – 2nd Gear are dedicated to our very own Hornster– the custom bike we built around the air horn from an American freight train. The project was intended to highlight the threat posed to cyclists by lorries, themselves fitted with air horns…albeit rather puny affairs that produce only about 100db at full blast. Testing of the Hornster registered over 136db. An ambulance siren at 20ft peaks at 120db. We perceive a doubling of sound for every 3db increase, so 136db is certainly loud enough to make a noise about the danger to cyclists from lorries. We have a copy of Velo – 2nd gear to give away. Simply leave us a comment at the bottom of this page and we will pick a winner next week. I just love cycling, especially long distance and revel in reading about the origins of cycling. So please kind & wonderful ETA, please send me a copy of Velo 2nd Gear. Kind regards and best wishes for 2019. Looks fun! I’d love one PLEASE. I believe in trying to encourage others into the joys of cycling and this book would be wonderful to appeal to trendy youngsters like my family. As well as being great for health, cycling is wonderfully diverse and can even be trendy!! Just bought a new coffee table and this would display perfectly on it. Great pop art jersey for the front cover, it’s a bit LOOK. Looks like a great book. I like the air-horn bike too! I’m sure there’s much about bikes that I don’t know. I could do with an education in style and cool for my daily cycle commute. I have a copy of Bicycles and Tricycles by Archibald Sharp B.SC. (1896) and a copy of Modern Cycles by A.J. Wallis Taylor (1897) both of which contain many interesting variations on pedal powered machines, though none have pedal powered caravans or camper-vans. It is the best thing since sliced bread, and just after who ever designed a circle and found it went around better than something with edges. Fantastic hooters. Great rubber. Rubbish pedals. Seems to be a fascinating read, a good one to share with others as well. Fit for a mellow, yellow velo-fellow! 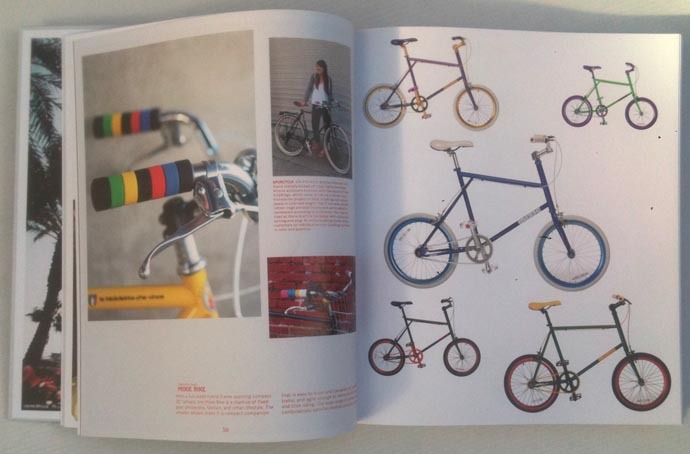 Ooh la la, cycle culture in a glossy book! Anything to promote more cycling, for personal health and to save the planet!! i wouldn’t recommend riding a bicycle facing backwards but each to their own. I’d love to read this please. This looks like a lovely book to grace a coffee table. Yes please. I’ll get some friends round so we can look at it together. It’ll be great, ‘cos sometimes it’s like we’re always stuck in second gear…. This looks like a fun read for all the family. This looks like a really great book! Looks like it’d give me some great ideas for customising my bike in my shed (much better ones than taping a rizla packet in the spokes so it sounds like a motorbike anyway! )… And it can sit pride of place on the table I made using my SNAP furniture brackets !